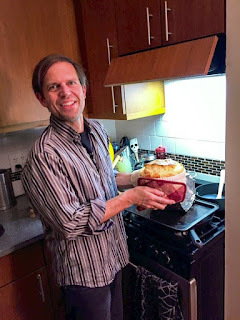 This will be remembered as the year of two soufflé nights, for, inspired by the previous one, I had some friends over on 6 December for my first ever cheese soufflé. Julia's recipe, naturally. And once again it's hard to believe that something so simple can be so elegant and delicious. Also roasted some new potatoes and made my favorite salad. And my friend H. brought over some chocolate pots de creme for dessert, too. Here's the view fresh out of the oven. You get a good view of the height in this one. In the moment I was thinking "God I hope I don't drop it." Seeing the photo after, I think "God I need a haircut." But that's a topic for a different, more sartorial, blog. 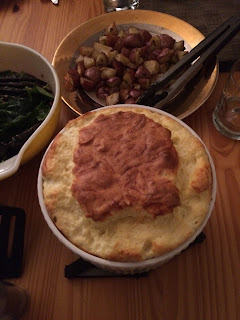 Anyway, one last "hooray for soufflé!"